Are Automated Garage Doors Right for You? Why choose automated garage doors? If you want to replace your garage door, look no further than the convenience of an automatic garage door. It’s a great opportunity to bring your home into the modern world. You can even connect your garage to the internet and create a smart home. We’re going to give you the lowdown on why you should consider an automated garage door and the features you should look for. When it comes to features, it’s best to start with the material of the garage door. Automated garage doors also have important safety features. These include motion detection, auto reverse, manual controls. Some remotes only operate with a personal code. For added safety, automated garage doors offer lock capable doors. Since 9% of burglaries start with garage doors, you can have peace of mind. You can choose to have windows for natural light in your garage. If you have an insulated door, you can get a double glazed window, a single glazed or dual (double glazed for insulated doors). Geek out features in some garage door brands allow you to connect your garage door to your smart home system. How Many Types of Automated Garage Doors Are There? Did you know that not all garage doors are created equal? Sure, you want a door that fits your home, but have you put much thought into it beyond that? Believe it or not, there are several types of garage doors to consider. These are based on the lifting mechanism used to open and close the garage doors. They each have their own advantages and disadvantages. If you have a two-door garage, you will want a chain drive system. A chain drive is strong enough to support the weight of a two-door garage, where a belt drive isn’t. A chain drive is more durable, but requires maintenance. You have to be sure to lubricate the drive regularly. This ensures the chain operates evenly. Maintenance also keeps the chain from rusting. If noise and speed are important to you, consider a belt drive. A belt drive is the quietest drive of the three. It also tends to lift a little faster than your average chain drive. There are a couple of drawbacks to a belt drive. Belts tend to wear out faster than chains, and they will have to be replaced. Fortunately, belts are easier to replace than chains. Manufacturers also understand that belts wear out and offer better warranties. A screw drive system moves along a steel rod placed in the middle of the door. This makes the door a little louder than a belt drive, but less noisy compared to a chain drive. The main advantage of this system is that there are very few moving parts. This makes it very reliable and easy to maintain. Automated garage doors have plenty of features. There are quite many, it might be overwhelming to decide which garage door is the perfect fit for your home. 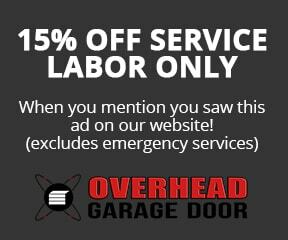 That’s where the expertise and knowledge of Overhead Garage Doors comes in. We’ve been around since 1981 and have worked with all types of homes in Lake County.